Note from Beth: I've been writing about online contests that use social media and crowdsourcing techniques. In December, I wrote about Pepsi's bold move of not spending money on Super Bowl ads for Pepsi beverages but using the money for lethal generosity through its Pepsi Refresh Project. I called Pepsi out in a post called "What can Pepsi Learn About Crowdourcing for Social Good?" A representative from Pepsi, Bonin Bough, left a comment and I invited him to write a guest post about they are learning about crowdsourcing for social good. As frequent readers of this blog know, many pitfalls of online contests have been discussed here. It’s an honor to have Beth ask me to guest post so I will do my best to live up to the quality readers are used to. With the launch of public voting on the Pepsi Refresh Project, now is a good time to discuss the efforts we’re taking to set the new standard for transparency in online contests. For those who don’t know, the Pepsi Refresh Project is a new effort to empower individuals to make a positive impact on the world. We’ve pledged to award more than $20 million to support innovative ideas that move communities forward. Anyone can apply for a grant and the public decides who wins. Each month, Pepsi will award grants up to $1.3 million to the winning ideas across six categories, including: Health, Arts & Culture, Food & Shelter, The Planet, Neighborhoods and Education. We collaborated with organizations that are dedicated to making a positive difference in the world to design and implement the Pepsi Refresh Project. Our partners include GOOD, a leading platform for thought and action revolving around pushing the world forward; Global Giving, an online marketplace that connects people who have community and world-changing ideas with people who can support them; and Do Something, the largest non-profit teen charity. Global Giving will vet contest applications to ensure they meet the requirements — for example, grant proposals may not contain profanity or involve political advocacy for a particular party. Each month, we accept 1,000 submissions, and all of the ideas that comply with our Official Guidelines are then posted online for public vote. We’re doing our part to bring transparency to the process by featuring a monthly leaderboard showing which ideas are getting the most votes. Pepsi has developed an Advisory Board of leaders of non-profit sectors with extensive experience in each of the six award categories. They’re CEOs, foundation presidents and some of the most innovative thinkers in social good, chosen for their proven track record and commitment to moving the world forward. They are not paid for their efforts and they will not have any influence on the balloting or awarding of grants. We’ve also compiled a team of Ambassadors, who are emerging leaders in the six award categories. They range from start-up founders to activists to neighborhood advocates. They will work to involve the nonprofit community and cultivate creative and innovative ideas in their category. Ambassadors will identify trends in submissions and invite thought leaders in their field to champion promising and innovative project ideas. So, what’s different about this contest than other online contests? First, never before has a trusted brand engaged in the work of doing social good with the level of resources behind the Pepsi Refresh Project. Pepsi is giving away an unprecedented $20 million in grants and inviting the public to rank the best ideas in an open vote. And the grants are available in a range of sizes, to foster ideas as small as a community garden and as large as groundbreaking medical research. The Pepsi Refresh Project stands apart from other programs in that it is open to a broad spectrum of ideas, and it will be a sustained year-long effort. Our theory of social change is that new ideas are born from optimism, a curious mind and a creative spirit. We can make a difference by equipping people with the means to bring their ideas to life. And, we believe social media and digital engagement can fuel, extend and inform these efforts. This focus on social engagement is driven from the highest points of the PepsiCo organization – and you can expect to see great things on this front from PepsiCo over the coming years. What is at the core of all of our efforts is how can we continue to help and support the space by being an organization that is open to exploring and working with all of the bright minds and emerging technologies that are driving social media forward. Through the Pepsi Refresh Project, we’re helping to move people’s ideas from wishful thinking to reality. The results so far have exceeded our expectations. After just 72 hours, we quickly hit our 1,000 submission limit for the first month — including at least one submission from each state. 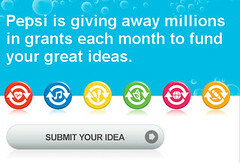 We look forward to tracking the winning ideas and we can’t wait to see what people come up with next. The lesson is: if you listen to what people have to say and give voice to their perspectives, you can inspire people and empower their ideas to refresh the world. 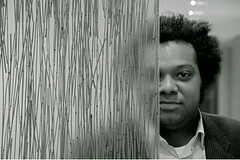 Bonin Bough is the Global Director Digital and Social Media at PepisCo. блин…писал-писал, а сообщение не отправилось и не сохранилось :) вообщем блог понравился. админу удачи в развитии.